This week, the OpenSesame crew is attending the American Society for Training & Development’s annual International Conference & Expo. In honor of ICE’s international focus (more than 25% of attendees are here from outside of the U.S.! ), we are thrilled to announce that our marketplace is now available in seven languages including English, Chinese, Spanish, French, Russian, German and Italian. Our mission is to build the world’s marketplace for buying and selling elearning content. Making the OpenSesame marketplace available in six more languages is just the first step towards unlocking access to a broad, fresh catalog of elearning courses for businesses and organizations worldwide. To view the different language options in OpenSesame’s marketplace, use the language menu on the top right section of the screen to select your language of choice. In addition to translating the marketplace, OpenSesame is focused on adding multi-language content to the catalog. 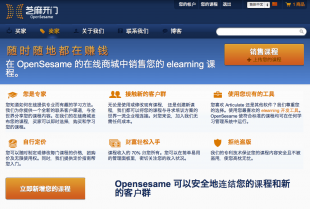 OpenSesame already features many courses in Chinese and we recently added French, Spanish and Italian language courses from the innovative language teachers at Capturator. We look forward to developing a broad selection of content to meet the growing demand for elearning resources worldwide. If you are interested in adding your courses (in any language) to the OpenSesame marketplace, please drop me an email or a tweet. We’d love to have you!